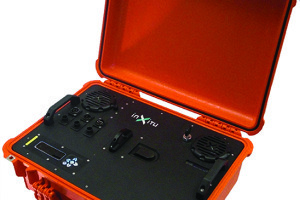 Portable XRD/XRF has completely revolutionized geochemical exploration, mine grade control, metallurgical and process analysis, on-site HAZMAT inspections and in-field counterfeit pharmaceutical determinations. The Terra’s high quality data and speed of analysis delivers quantitative real-time compositional chemistry, right at the point of the sample location, where you need it most. 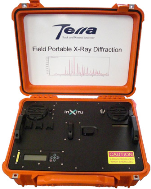 The Terra Field Portable X-ray Diffraction/X-ray Fluorescence is, simply put, the evolution of X-ray diffraction analysis. 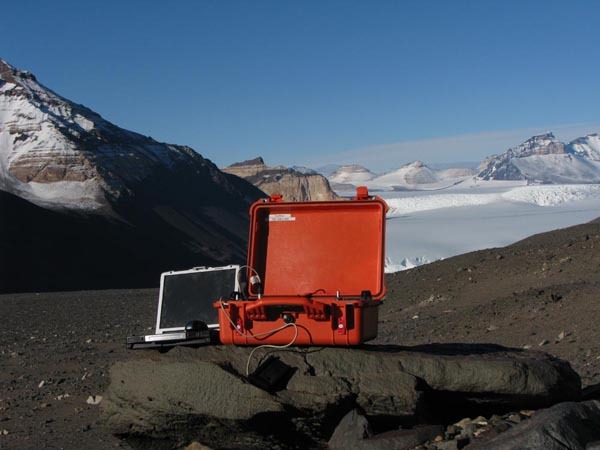 The technology used in the portable rock and mineral analyzer received a prestigious R&D 100 award and was chosen to fly on the Mars Science Laboratory Rover scheduled for launch in 2011. Check out the NASA site for more. The Terra is the first truly portable combination XRF/XRD system designed specifically for rock and mineral analysis. 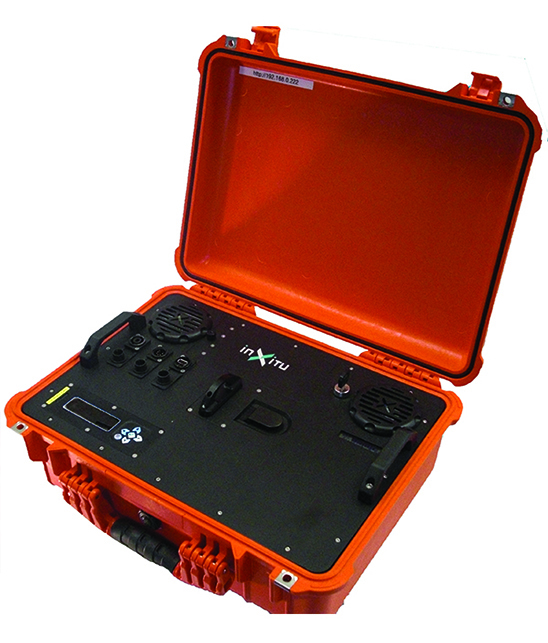 Now field XRD work can really be done in the field. 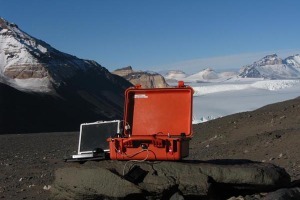 The Terra can be configured with everything you need to acquire and analyze diffraction data in a rugged compact case. With a patented sample handling system, not only is sample preparation time minimized, but accuracy in peak identification previously only available using laboratory based systems can be achieved. Typically, XRD experiments require a finely ground sample which is then pressed into a pellet. This requirement is formed by the need to ensure sufficient random orientation of the crystals in the sample. 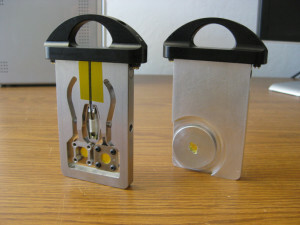 Terra introduces a patented new way of addressing this issue. With only 15 mg of sample, Terra convects the sample with its integrated sample vibration chamber. By doing so, Terra is able to present all different orientations of the crystal structure to the instrument optics. This results in a superb XRD pattern, virtually free of problematic preferred orientation effects found using more classic preparation methods. 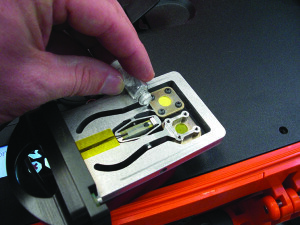 Terra operates off software embedded in the unit itself. The user accesses the operating system through a wireless connection (802.11 b/g). This unique method of operation allows for a wide degree of flexibility in controlling the instrument and subsequent data handling. 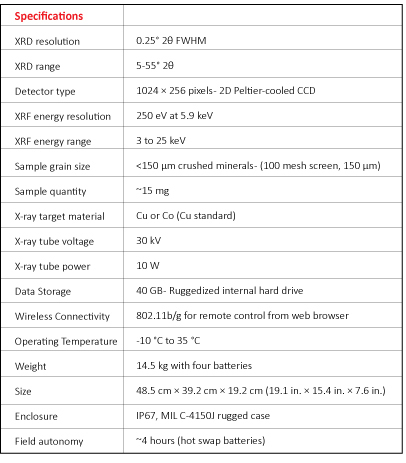 Terra is shipped with the necessary software (XPowder) for processing the resulting X-ray diffraction data. This includes the AMSCD mineral database. 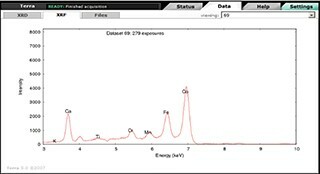 Should the user wish, XPowder provides the ability to use the ICDD Powder Diffraction Files (PDF). 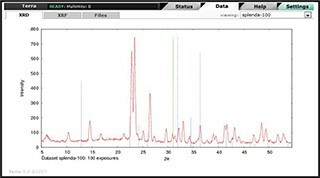 Terra is configured with the necessary software (XPowder) for processing the resulting X-ray diffraction data. 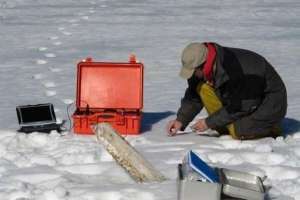 This includes the AMSCD mineral database. 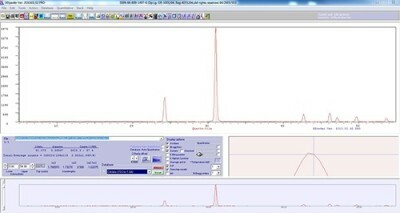 Should the user wish, XPowder provides the ability to use the ICDD Powder Diffraction Files (PDF). For quantitative analysis, XPowder comes complete with Relative Intensity Ration (RIR) quantitative analysis methods as well as full pattern analysis tools. Further, Terra provides XRD pattern data in a variety of file formats making XRD pattern interpretation in other third party programs easy and available. 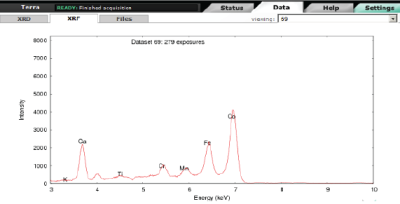 Terra XRF software processes the sample data to determine and label present elements, calcium (Ca) through uranium (U), by energy (keV). The relative intensity can be used for semi-quantitative results. Limestone & Cement – Easily perform quantitative analysis of common minerals associated with limestone – alpha-quartz, asbestos minerals, calcite, dolomite and more. 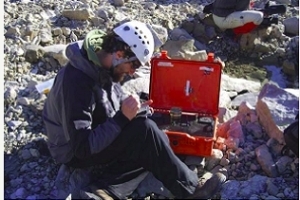 In cases where the quarry contains various levels of dolomite, the Terra quickly determines this mineral in the range of 0.50 to 9.0% with an error of only 0.02%. For more information on the Terra Portable System please visit our Knowledge Center.